The rules of Scrum are easy. Implementing them is hard. If you want to learn both, this is the course for you. Dr. Jeff Sutherland ran the first Scrum team in 1993, and has been the driving force behind it for nearly twenty years. After taking this course, you will not only know everything you need to be a Scrum Master, but you will be energized and empowered to make real change. Dr. Sutherland presents not only the concepts of Scrum and Agile, but, as he invented most of them, he gives you the reasoning, thinking, and research behind them. This course will focus on the Scrum Master, the Product Owner, and the Team in a software development organization. However, the course is useful to everyone in a company that uses Scrum. Jeff coaches Scrum teams in sales, marketing, finance, client services, senior management teams, investment groups, and non-profit organizations as well as software development teams. You will often find a CEO, CFO, or CIO in these classes, as well as others interested in expanding Scrum throughout their companies. Students will get real, hands-on practice on key Scrum concepts, how to build a backlog, how to plan for a release, the daily Scrum meeting, how to estimate a project, tracking progress with a burn down chart, and the key ways to improve your team’s productivity. 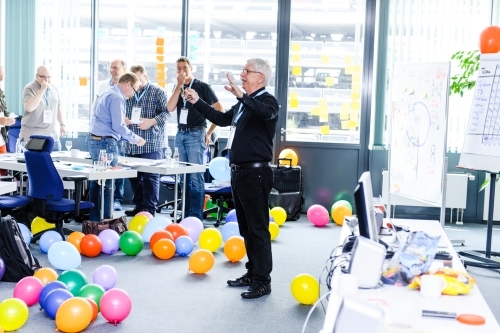 The exercises drive home the theory of Scrum with real practice. All attendees who complete the course and pass the Scrum Alliance online exam will become Certified ScrumMasters (CSMs), which includes a two-year membership in the Scrum Alliance, where additional Certified ScrumMaster-only material and information are available. Students are also eligible for 16 PMP PDUs with the Project Management Institute. This course will also satisfy 16 of the required 21 training hours for the new PMI-ACP (PMI-Agile Certified Practitioner). This seminar is organized in cooperation with Scruminc. The company Jeff Sutherland foundet. Here the course content in Bullit Points you find a lot of topics that Jeff Sutherland adresses in his course in his "Scrum Blog". 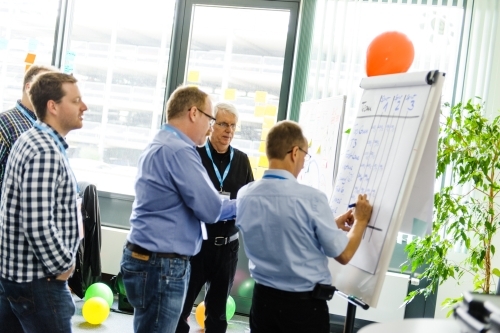 Whether youre a manager, programmer, tester, analyst, product manager, or someone interested in working on or with a Scrum team, this course is suited for you. You will leave with solid knowledge of how and why Scrum works. Through practical, hands-on exercises and small–group discussion you will be prepared to plan your first sprint immediately after this class. Of course, there will be updated material and training exercises in the course which you cannot get from books. Before the class participants should read The Scrum Guide (http://www.scrumguides.org) form Ken Schwaber and Jeff Sutherland. Familiarity with the basic Scrum concepts will help you get the most out of the course. vielen Dank für die Schulung. Mit hat es Spaß gemacht! 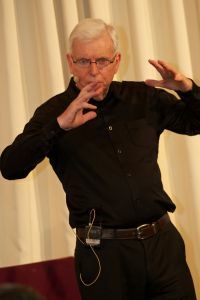 Jeff Sutherland ist der Mitbegründer von Scrum und ein erfahrener Scrum Consultant. Jeff Sutherland erfand Scrum bei der EASEL Corporation 1993. Zusammen mit Ken Schwaber formalisierte er das Scrum Framework für die OOPSLA 95. Als Gründer seiner Firma Scruminc. Trainer für ScrumAlliance und Agile Coach, setzt Jeff die Vision für den Erfolg mit Scrum.